It has been a year since Helena Kelly's body was found, but with no-one arrested for the murder or even any suspects in custody, her sister Aerin struggles making sense of her life after Helena. On the outside she looks like a superficial yet happy party girl, but on the inside she is anything but. Aerin needs closure. But how will she find out once and for all what happened to her sister between the day she went missing and four years later, when she turned up dead? Aerin isn't the only one drawn to the case as amateur sleuths from all over the country are looking into it via online community Case Not Closed. Among them Seneca, Maddy, and Brett, tree young adults who each for different reasons have more than a casual interest in missing person cases and murders. They're an unlikely group of characters to band together, but throughout the investigation they become closer than they thought possible – perhaps even too close. I am a big fan of Sara Shepard's novels, which are usually filled with outrageously privileged teenagers whose worlds are turned upside down by murder and mayhem. While there are certainly some rich kids in The Amateurs, the make up of the main characters is more diverse than ever before, and with the majority of the action not taking place in a high school setting it added a sense of the unknown and excitement, in what could've so easily become a formulaic and predictive story. And the one thing you can always be certain of in one of Sara's novels is that the story will grip you from start to finish, throwing plenty of surprises and red herrings at you along the way. No matter how many of her books I have read, I never manage to predict the full outcome of one of her stories. I might suspect some plot twists along the way, but there is always something thrown in to completely throw me off – and I love it. I also have to give her huge credit for not only the sheer volume of books she writes, but her ability to make each series unique and memorable. They might all have mystery and killers at the heart, but the settings and characters always feel fresh and exciting, making it a joy to delve into an entirely new series and fall in love with it so hard that she has me hooked once more from one book to the next. The Amateurs had an awesome premise with a fun and constantly engaging execution that has me craving the next instalment already. 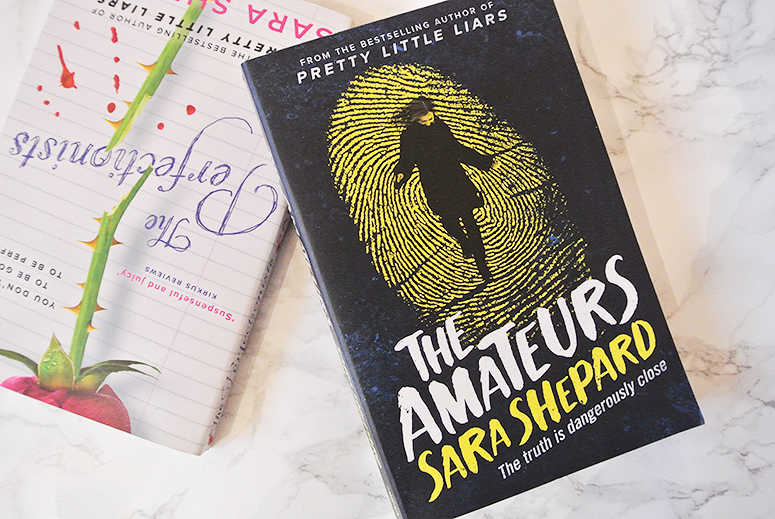 Sara Shepard is the queen of writing addictive serialised murder mysteries in a contemporary setting, and if you read and enjoyed any of the Pretty Little Liars, The Lying Game or The Perfectionist books then this is going to be one you're going to have to add to your wish list too. It's at least as good a kick-off to an ace new series as its precedents, if not better. The Amateurs is published by Hot Key Books and you can get your copy from Foyles or your own preferred retailer.